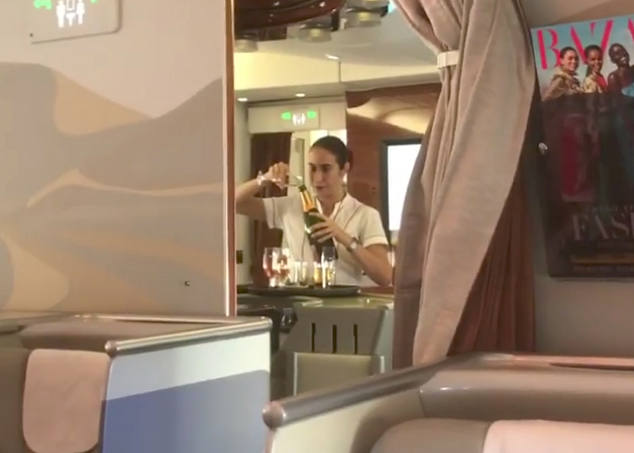 A video has sparked outrage after it appears to show an Emirates flight attendant pouring champagne back into a bottle. The video was captured by Russian passenger Yevgeny Kayumov, who filmed it while travelling in business class on an Emirates A380 to Dubai. Some commentators have speculated that the flight attendant could have been pouring the bubbly back in the bottle for later disposal, as liquids are not allowed to be disposed of until the plane is in flight. We wonder – if this is the case – why she chose such a difficult vessel to pour the drink into.